WHEN? The summer SCI residency will run from 9-16 July 2014. WHERE: We will gather in Dingle, a spot National Geographic called “the most beautiful place in the world.” Dingle is a lively seaside village with superb traditional music, located on a mountainous peninsula on the stunningly scenic west coast of Ireland. Students and faculty will stay together in the elegant Coastline Guesthouse, right on the harbor and a short walk to town. Come see why Ireland has inspired so many wonderful writers over the past century. DEADLINE: Applications must be emailed as MSW attachments to SCI coordinator Ted Deppe by 11:59 p.m. (your time zone) Monday, 18 November 2013. WHO’S ON THE FACULTY IN JULY 2014? Stonecoast’s David Mura and Ted Deppe will be joined by prominent Irish writers, to be named later on this winter. During the program’s first sixteen residencies, visitors have included Irish writers Paul Durcan, Claire Keegan, Harry Clifton, Eiléan Ní Chuilleanáin, Theo Dorgan, Kate Newmann, Kevin Barry, Dermot Bolger, Paula Meehan, Gabriel Fitzmaurice, Sinéad Morrissey, Carlo Gébler, Anthony Glavin, Deirdre Madden, Eamon Grennan, Hugo Hamilton, Joan Newmann, Tony Curtis, Nuala Ní Chonchúir, Martin Malone, and Macdara Woods; Pulitzer Prize winner Stephen Dunn; traditional storyteller Liz Weir; Trinity College professor emeritus Vincent McBrierty; actors Seán Coyne and Tegolin Knowland; and traditional musicians Áine Uí Laoith and Eilín Ní Chearna. WHO IS ELIGIBLE? Any Stonecoast student who will not be attending his or her first residency in July 2014 may apply. Fifth-residency students and alumni may also apply to fill any spots that are not taken by continuing students. HOW ARE STUDENTS SELECTED? We will accept ten Stonecoast students. Seniority is an important factor in selecting students, but we also consider balancing workshops and creating a harmonious group. The spots on the roster are filled first with continuing students, but if there is space available we are happy to have fifth-residency students and alumni join us. We hope to decide on the roster and notify applicants by the end of November. WHAT SHOULD I EXPECT? You will be totally immersed in Irish literature and the beautiful Irish landscape. 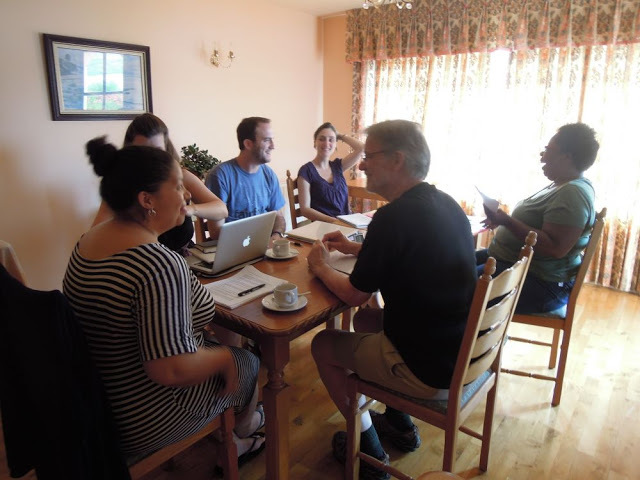 While offering a unique cultural opportunity, residencies in Ireland also maintain the same rigorous academic discipline as the Stonecoast program in Maine. A full schedule of workshops, seminars, and readings are supplemented by a field trip, which in the past has included trips to the Great Blasket Island, site of an astonishing literary renaissance during the first half of the 20th century. Students are encouraged to arrive early or stay late, so they can explore Ireland and/or Europe. WHAT DOES IT COST? Tuition is the same as in Maine. Because of the dollar’s slide against the euro, the cost for room and board is $85 more than in Maine. Students are responsible for their own airfare. WHO CAN I WORK WITH FOR THE FALL SEMESTER? Students can request to work with mentors from the full Stonecoast faculty for the Fall 2014 term, whether or not the faculty member is in Maine or Ireland in July. HOW DO I APPLY? Contact Ted Deppe for an application Theodore.Deppe@maine.edu and submit before midnight (your time zone) on Monday 18 November 2013. If you have any problem creating a MSW (.doc or .docx) file, feel free to type the relevant information from the application into an email and send it to the same address. WHEN? The winter SCI residency will run from 16-23 January 2014. DEADLINE: Applications must be emailed as MSW attachments to SCI coordinator Ted Deppe by 11:59 p.m. (your time zone) Wednesday, 22 May 2013. WHO’S ON THE FACULTY IN JANUARY 2014? Stonecoast’s Jaed Coffin and Ted Deppe will be joined by prominent Irish writers, to be named soon. During the program’s first fifteen residencies, visitors have included Irish writers Paul Durcan, Claire Keegan, Harry Clifton, Eiléan Ní Chuilleanáin, Theo Dorgan, Kate Newmann, Dermot Bolger, Paula Meehan, Gabriel Fitzmaurice, Sínead Morrissey, Carlo Gébler, Anthony Glavin, Deirdre Madden, Eamon Grennan, Hugo Hamilton, Joan Newmann, Tony Curtis, Nuala Ní Chonchúir, Kevin Barry, Sarah Rees Brennan, Martin Malone, and Macdara Woods; Pulitzer Prize winner Stephen Dunn; traditional storyteller Liz Weir; Trinity College professor emeritus Vincent McBrierty; and traditional musicians Áine Uí Laoith and Eilín Ní Chearna. WHO IS ELIGIBLE? Any Stonecoast student who will not be attending his or her first residency in January 2014 may apply. Alumni and fifth-residency students may also apply. HOW ARE STUDENTS SELECTED? We will accept ten participants. The spots on the roster are filled first with continuing Stonecoast students, but if there is space available we are happy to have fifth-residency students and alumni join us. Seniority is an important factor when selecting from continuing students, but we also consider balancing workshops and creating a harmonious group. We hope to decide on the roster and notify applicants by the end of May. WHAT SHOULD I EXPECT? You will be totally immersed in Irish literature and the beautiful Irish landscape. While offering a unique cultural opportunity, residencies in Ireland also maintain the same rigorous academic discipline as the Stonecoast program in Maine. A full schedule of workshops, seminars, and readings are supplemented by a field trip; past field trips have included such things as trips to the James Joyce tower and museum in Sandycove and the astonishing W.B. Yeats exhibit at the National Library in Dublin. Participants are encouraged to arrive early or stay late, so they can explore Ireland and/or Europe. WHAT DOES IT COST? Tuition for continuing students is the same as in Maine. Because of the dollar’s slide against the euro, the cost for room and board is $85 more than in Maine. Participants are responsible for their own airfare. The cost for alumni or fifth-semester students is $880 tuition and $1,060 for room and board. WHO CAN I WORK WITH FOR THE SPRING SEMESTER? Continuing students can request to work with mentors from the full Stonecoast faculty for the Spring 2014 term, whether or not the faculty member is in Maine or Ireland next January. 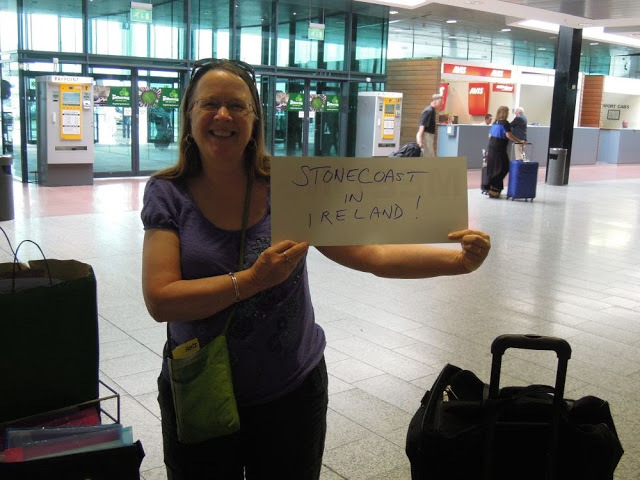 We hope you can join us as Stonecoast in Ireland turns Sweet Sixteen! Applications will be accepted until Wednesday 18 April for the Stonecoast residency which will take place in Howth, Ireland 10-17 January 2013. The application deadline is coming up soon. Although continuing students get first priority, alumni have taken part in our last two Irish residencies, and we’d love to hear from you if you’re interested. Please email SCI coordinator Ted Deppe at theodore.deppe@maine.edu for full information and an application form. Debra Marquart and leading Irish writers will join Ted Deppe to provide a stellar academic experience–and it is lots of fun, too!